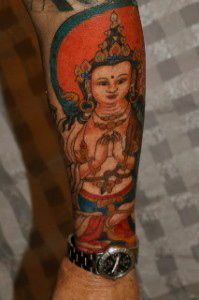 There are many beautiful Buddha tattoos available these days. Choice of design, color and symbols are vast. 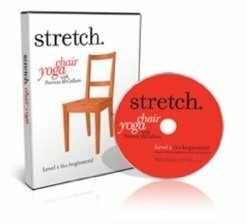 From a Tibetan Buddhist perspective the body is not a clean place. Buddhas, being Tibetan Religious symbols are sacred and should not be placed anywhere that is not clean. 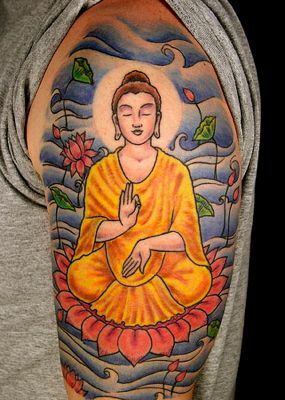 Buddha Statues, paintings or any representation including Buddha Tattoos should be kept in high and clean places. Also Tibetan or Sanskrit mantras or any letters at all are considered sacred and should not be put on the ground or even stepped over. Have a nice tattoo? Come and share it with us! 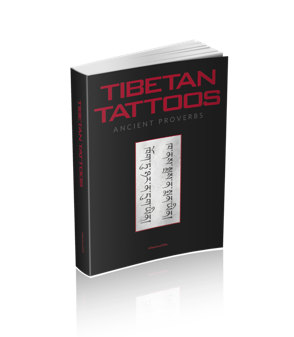 In ancient Tibetan culture, names, words, mantras or Buddhist symbols were not drawn on the body for decoration. But since the Chinese invasion of Tibet, some refugees in exile have begun to tattoo their bodies. I once attended a teaching of His Holiness the Dalai Lama in a new monastic temple in south India. He was not at all pleased that thousands of small Tara statues had been used extensively to decorate the new walls. The Dalai Lama emphasized that the Buddhas were never to be used as mere decoration. He then suggested that the statues be returned and the money given to the poor. 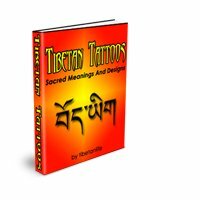 These tattoos can be quite beautiful if done well but best to not offend a Tibetan by placing a design anywhere below the waist!